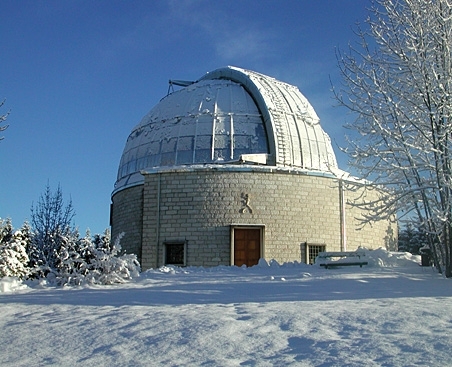 During the construction of the Asiago Astrophysical Observatory I had from the arch. Calabi and from the Rector of the University of Padova Carlo Anti, the assignment of making a bas-relief to be set over the entrance door to the dome, to represent the astronomer. I then produced, using the local stone (Asiago marble), a winged genius flying through the celestial sphere holding an astrolabius. These past years we have seen man obtain better and better achievements in space, and it seems to me that this work of mine brought good auspices to the knowledge and conquer of the skies. The stars represent the celestial sphere. 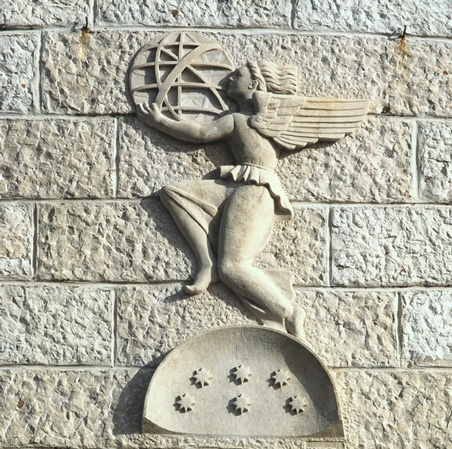 This description of the frieze set over the entrance of the dome of the Galileo 122cm telescope in Asiago, was given in 1992 by the author, the sculptor E. Pernigotto, to the Dean of the Department of Astronomy, Prof. Francesco Bertola.